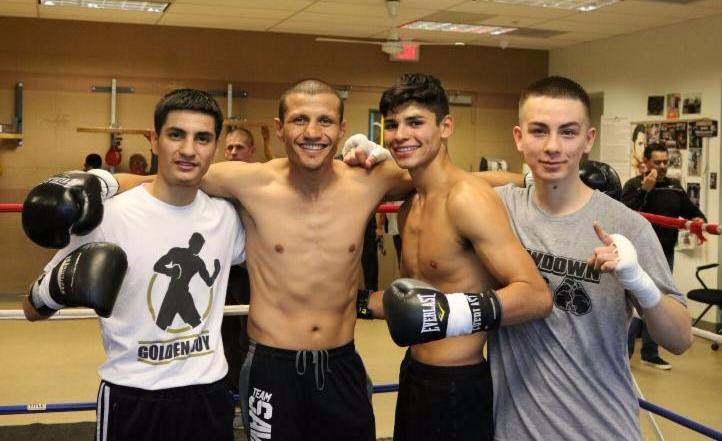 Jesus “Renuente” Soto Karass (28-12-4, 18 KOs) hosted a media workout today at the Pascua Yaqui Wellness Center in Tucson, Arizona ahead of his 10-round welterweight fight against Juan Carlos “Merengue” Abreu (19-3-1, 18 KOs) in the main event of the Nov. 2 edition of Golden Boy Boxing on ESPN at Casino Del Sol in Tucson, Arizona. Ryan “Kingry” Garcia (11-0, 10 KOs), who will compete in the co-main event in the first defense of his Junior NABF Super Featherweight title against Cesar Valenzuela (14-5-1, 5 KOs), also participated in today’s event. Cesar Diaz (6-0, 5 KOs), the bantamweight prospect who will return in a six-round fight, and Christopher Gonzalez, the 140-pound prospect who will make his professional debut, took part as well. Soto Karass vs. Abreu, a 10-round welterweight fight presented by Golden Boy Promotions in association with Showdown Promotions and sponsored by TECATE, THE OFFICIAL BEER OF BOXING and Hennessy “Never Stop, Never Settle” takes place Nov. 2 at Casino Del Sol in Tucson, Ariz. Doors open at 5:00 p.m. ESPN and ESPN Deportes will transmit the fights at 11:00 p.m. ET/8:00 p.m. PT. ESPN3 live coverage of the undercard fights will begin at approximately 9:30 p.m. ET/6:30 p.m. PT. Tickets for the show currently on sale and range from $45.00-$125.00 (includes convenience fee). Tickets are available for purchase at the Casino Del Sol gift shop and online at www.casinodelsol.com. Videos and images are available for download by clicking here or copying and pasting the link: http://bit.ly/SotoKarassAbreu. Credit must be given to Golden Boy Promotions for any photos/video. For more information, visit www.goldenboypromotions.com; follow on Twitter @GoldenBoyBoxing, @OscarDeLaHoya, @ESPN and @ESPNBoxeo; become a fan on Facebook at www.Facebook.com/GoldenBoyBoxing, www.facebook.com/espn.fnf, and www.facebook.com/ESPNBoxeo; and follow on Instagram @GoldenBoyBoxing, @OscarDeLaHoya, @ESPNBoxeo. Follow the conversation using #GBPonESPN.